Review by AllTheBestFights.com: 2015-04-10, good fight between Will Brooks and Dave Jansen: it gets three stars. The Bellator Lw champion Will Brooks entered this fight with a professional mma record of 15-1-0 (60% finishing rate) and he is ranked as the No.5 lightweight in the world (currently the #1 in this division is Rafael dos Anjos). The only man who stopped him (in one round) was Saad Awad in 2013 (=Brooks vs Awad), after this bout he has won six consecutive fights beating Michael Chandler twice in 2014 and winning the Bellator Lw belt (=Chandler vs Brooks I and Brooks vs Chandler II). His opponent, Dave Jansen, has an official record of 20-2-0 (55% finishing rate) and he entered as the No.23 in the same weight class. He suffered two consecutive defeats in 2010, against Kamal Shalorus and Ricardo Lamas, but since then he has collected seven victories winning the Bellator Lw tournament (season seven) in 2013 beating Marcin Held in the final (=Jansen vs Held). After this bout he has fought once winning over Rick Hawn (=Hawn vs Jansen). 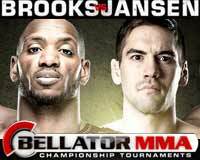 Brooks vs Jansen, main event of Bellator 136, is valid for the Bellator lightweight title (Brooks’ first defense). Watch the video and rate this fight!